Have you ever been so excited about a lighting fixture that you cannot stop playing with it? I’ll be honest here, that is almost always the case when a new light hits my doorstep. It is kind of like Christmas every time. Though, this time, I had to travel across the Atlantic with this particular light. I picked it directly from the factory, hot off the production line. After visiting the Robe factory in the Czech Republic, I was able to take home one of their latest moving heads, the MiniMe. 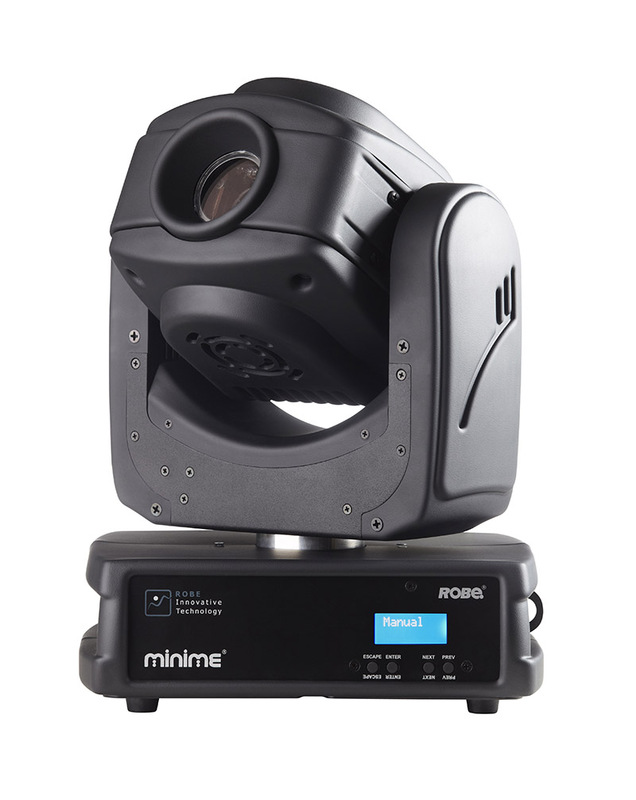 The ROBIN Series MiniMe is more than just a moving head, it is a digital projector on a moving yoke with a built-in media server. It doesn’t sound like anything new, as Robe has had a digital light series for some time. The difference starts with the size, then continues with what is inside. Starting off with the size of the MiniMe, its maximum height is just under 14 inches, and just under 10 by 8 inches at the base. That’s comparable in size to Robe’s LEDBeam 100 fixture (12.4 by 9.2 by 5.9 inches) — and considerably smaller than the 2-foot, 8-inch stature of actor Verne Troyer, who played Mini-Me in the Austin Powers movies. The MiniMe’s RGB LED source promises as much light as a 2,500-lumen lamp projector. Yes, you read that right, a projector! The MiniMe is not a typical LED profile, spot or wash fixture, it is a digital projector on a moving yoke. And while it might not be as good a fit with enormous venues as Robe’s larger digital projectors, the MiniMe is designed to hold its own in small to medium-sized venues. The MiniMe has an aspect ratio of 16:10. So if you have 16:9 content, prepare yourself, there may be some cropping or adjustments that need to be made. It has a resolution of 1280 by 800 pixels with a beam angle of 16° and a throw ratio of 3:5:1. Here is where the real innovation and the good stuff starts to unfold about the MiniMe. With any digital light, you need a media server of some sort in order to display content through it. Since the MiniMe is so small, Robe decided to design custom media server just for the MiniMe. It is all self-contained within the fixture. Since a typical media server can be rather large and would not be a good fit with the ultra-compact MiniMe, Robe went back to the drawing board and custom-built a media server based on the Raspberry Pi hardware, (www.raspberrypi.org). If you don’t know what a Raspberry Pi is, it is a small, small computer (credit card-sized) that is capable of doing almost anything you want. The operating system, a version of Linux OS, is also customized to provide just the necessary software to operate the media server. The built-in media server functions and works similar to most media servers on the market, but with a significant difference — it is self-contained, with external software controller or interface other than DMX values from a console. As such, it is able to play back a multitude of movie and picture file formats, but the user will find some limitations in terms of file folders for content. On the plus side, Robe’s internal media folder is jam packed with stunning visuals — including movie clips, static images and some stock gobo designs found in all of the company’s ROBIN series of fixtures. The ultra-compact MiniMe’s built-in media server managed to pack in a few more surprises, including some powerful built-in video manipulation controls —keystone correction, playback speed, rotation and more. The media server also gives users access to a wide range of color correction, gel colors and mixing possibilities. I loved the rainbow gradient effect, not just on a static color, but on any content played back through the MiniMe. Now my “stock” gobos can be infused with crazy color effects, not just static or split colors. Like other Robe fixtures, the MiniMe offers plenty of control options. You can choose from 5-Pin DMX, Art-Net via an RJ45 connection or even wireless control via LumenRadio. Although the latter is not built in, if that’s the option you want, you can get it via a wireless receiver designed specifically for the MiniMe that plugs into the 5-pin connection. The receiver then gets it signal and power through that 5-pin connection. This little wireless receiver design would be a marketable product on it own! During the entire 12-hour flight back to the U.S. from Europe, I was wishing that there was some way I could break open the road case and start playing around with the MiniMe. In time, good things come to those who wait. After catching up on the jet lag and months of playing and putting the fixture to the test, I am still thinking of ways to make it do amazing and different things. It was a sad day when I had to send the MiniMe back — I felt like I had just scratched the surface exploring what it could do. The MiniMe is a powerful little fixture that has endless possibilities. It may not show up on a big tour, but for small to medium sized applications — corporate gigs, parties, or in a retail setting — this fixture offers a seemingly endless array of visual possibilities, particularly where custom gobos are needed night after night. No more waiting for those custom gobos to be made; with the MiniMe, all you need is the digital file and away you go!